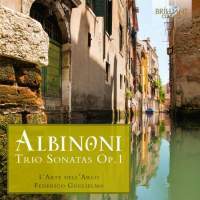 The fact that so very few recordings exist of Albinoni’s Op 1 Trio Sonatas feels like a strange quirk of history, given the popularity of some of his other instrumental works. As it is, though, L’Arte dell’Arco’s offering becomes only the second complete recorded set, the other being Parnassi Musici’s 2001 recording for CPO. It marks the beginning of a new series of Albinoni’s complete instrumental music for Brilliant Classics, and if it’s the standard-setter then we’re in for some great music, at a budget price. Albinoni published these trio sonatas in 1694; that’s 14 years before Corelli’s own Op 1 Trio Sonatas and 11 years before his fellow Venetian Vivaldi’s Op 1 set. With those facts in your head these will yield no stylistic surprises. As with their recordings of Tartini violin concertos (Dynamic), L’Arte dell’Arco have opted for a modern A=440 tuning (Venetians appear to have tuned comparatively high against the Baroque norm), and on the whole their musicmaking gives the earlier Parnassi Musici recording a run for its money, with a crisp, vibrant, semi-dirty sound and a lucid balance through which the theorbo pokes delightfully. Violinists Federico Guglielmo and Glauco Bertagnin are zingy and stringy of tone, with warmth aplenty too, and some subtly ear-tickling ornamentation. Cellist Francesco Galligioni dances the bass-line along (try No 2’s Vivace), and there’s some immensely musical underpinning from keyboardist Roberto Loreggian. It’s not a clean sweep of brilliance, I should say. For the most part, the violins make for a beautifully consonant partnership but there is the occasional intonation lapse and unpleasant scratch. There’s also a whiff of budget about the production values at times: listen in to the ends of tracks and you’ll hear the break in ambience (it’s recorded in Padua’s Abbazia di Carceri d’Este). Still, these are quibbles which at this price are not worth worrying about.